These are the five vertebra of the lower back. The last vertebra (on the upper left of the picture) attaches to the sacrum, and the top vertebra (on the right of the picture) attaches to the thoracic section of the back. 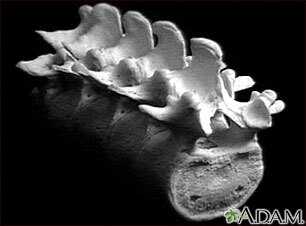 The vertebra are broader and stronger than the other bones in the spine. This allows them to absorb the added pressure applied to the lower back, but this area remains a common site of injury. The vertebra are numbered from one to five and are labeled L1, L2, L3 etc. from the higher bones to the lower.